In recent years San Francisco has seen dramatic shifts in its filmic landscape. First we saw the death of so many repertory houses as audiences shifted to flashier cineplexes. Then we watched the decline of cinema's physical culture as celluloid was replaced by continuously advancing digital technologies. Critically, we've seen the Fourth Estate become anemic with online venues gaining precedence as sources of information, often with unprofessional content by unpaid writers. And now we see a city under siege by socio-cultural forces intent upon dismantling so much of what the City once represented to its residents and the world at large. What was public has become increasingly privatized. Ethnic diversity has become a quaint notion of the past. Liberal and progressive politics? Forget it! Education? Too expensive! Social services? Go home to Mother! The City has been bought and has become a playground for the rich who have created one of the worst housing crises in recent memory, as long-time residents are evicted from homes converted into AirBnB havens, even as incessant high-rise condominiums are constructed for the criminally insane. I could weep in my tea for hours if not for fierce individuals like Joshua Grannell (aka Peaches Christ) who have negotiated these alarming cultural trends with creative perseverance and some good belly laughs. Low income and ethnic minorities may be exiled from the city but Joshua and his colleagues have (metaphorically) boasted on the marquee of the Castro Theatre: "Drag is here to stay." With his popular send-ups of beloved films, Peaches Christ Productions keeps something alive in San Francisco that we desperately need and, perhaps more importantly, finds new converts among a new public in San Francisco. That new public has a fiendishly funny opportunity to convert with this weekend's presentation of Barry Sonnenfeld's Addams Family Values (1993). My thanks for Joshua for joining me for iced coffee at Café Trieste, an appropriately San Francisco tradition, for a discussion of this weekend's event. Michael Guillén: Y'know, Joshua, you just keep going and going. I have major respect for your continuing contributions to San Francisco's cultural landscape. Guillén: In recent years I've been especially impressed with how you're starting to collaborate with the city's fine art museums, lately with the San Francisco Symphony, such that you now strike me as one of the few individuals I know who is bridging so-called high culture with so-called low culture. Can you speak to that? Why is it important to do that? Was that anything you expected to be doing? Grannell: I never really expected it because, honestly, I never really even expected to make enough money to have a career doing Peaches Christ, or making movies. When I started, it was always a dream to be able to make a living doing what you love; but, it seemed so unrealistic and outside my grasp. For years and years it was fine to lose money as a performer and filmmaker—which I did for a long time—so, goodness, I didn't really believe it when institutions started asking me to collaborate with them. It started in Europe first. After my short films had started playing in film festivals like Frameline, some horror film festivals and underground film festivals, a museum in Belgium brought me over to do a retrospective. It blew my mind and I thought it was a fluke and a random once-in-a-lifetime thing. Later, when it started to happen with more frequency, as with the deYoung or the Academy of Sciences, it just seemed surreal. I never expected it. However, now that I have a foot in both worlds, it makes sense when they reach out to those of us in the underground because, in some ways, we're actually able to present their audience with something really fresh and different that they're not used to. It's been interesting to bridge those worlds. Guillén: With this true measure of success in mainstream venues, do you still consider yourself underground? Guillén: So it's a constant negotiation with scale and context? Guillén: And further, I'm aware that you have a range into the hinterlands. Even folks in Boise, Idaho know who you are. Grannell: That surprises me as much as anyone else. I feel like I live in the bubble of San Francisco. Guillén: I'd be interested to survey who's accessing your work online in contrast to the live performances. Culture has achieved that kind of alternate access, though of course that doesn't hold a candle to watching you in live performance. Case in point, your upcoming send-up of Addams Family Values. This is a new show for you? Grannell: It is. This is the first time we've done anything Addams Family, which may seem a little bit odd, but there was a sense of the first film coming out [The Addams Family, 1991] and enjoying the performers in the movie and loving the cast. Guillén: Christina Ricci as Wednesday!! Grannell: Oh God, Christina is brilliant! Anjelica Huston is brilliant! Raul Julia's brilliant! Christopher Lloyd! The casting is so inspired—but, not really loving the movie. I appreciated it. I enjoyed it. I liked it but it left something to be desired that was completely filled with Addams Family Values. It's that rare case where a sequel comes along that is better. Someone said to me, "Oh, you just like it better because it's campier" and I said, "No, it's a better film." It's better written. It's one of the best-written screenplays of the last 20 years. The dialogue alone is so hilarious, on par with an early John Waters film. Every line of dialogue is so great and inspired and the performers are at the top of their game. It's wild, the pacing is perfect, and it taps into all the things about the Addams Family that you would want it to. This is one of the few times, with the exception of The Evil Dead, where we've actually done the sequel and not the original. Guillén: I'm well aware that a Peaches Christ event is a team effort with many people involved, and—because this is a new project—can you give me a sense of how the team decides on what they want to do next? How you negotiate an approach to a film? How does that process work? Grannell: I have a list of ideas that's probably longer than actual dates that we can do. It's been fun moving over to the Castro Theatre from the Bridge Theater because—unlike Midnight Mass, where it was a summer series and I had to do a different show every week, which is limiting to the amount of work you can put up on a weekly basis as we got more and more ambitious—by moving to the Castro and spreading things out bi-monthly, it's allowed me to open my mind to doing these bigger spectaculars and theater pieces and pursuing that tradition of queer parody, which has existed way longer than I've been on the scene. When I moved to San Francisco, I remember hearing about The Dolls, the drag version of Valley of the Dolls. I never saw it live but did see it through a bootleg copy. Then there was Christmas With the Crawfords. Seeing this theater tradition of primarily gay men dressing in drag and sending up these things that they loved so much. At the Bridge, where we were locked into a midnight format, we could do it but it was tough to do a big theater show every week. Moving to the Castro has been such a joy. There are movies that I've been wanting to celebrate for years. Even movies that we parodied at The Bridge, like Whatever Happened to Baby Jane?—which we'd done a number of times—we never got to do the big theater send-up. It's been really fun moving to the Castro and I've been writing a lot of new content for the last couple of years. Next year we're going to bring some of those older projects back because we've got really good ones that San Francisco would enjoy again. We've also launched a lot at the Castro that then go on to other cities and have longer legs. For example, we did Return to Grey Gardens two years ago and Jinkx Monsoon and I haven't really stopped doing it. Guillén: That's actually the last time I interviewed you, when you launched Return to Grey Gardens. Guillén: Every two years or so I start whimpering to talk to you to try to catch up with all you've done inbetween. Especially now that I live in Boise—even though I come back to San Francisco frequently—I'm struck more than ever by how much is changing in San Francisco, which only makes me more pleased how well you're doing in continuing this tradition. Do you have a sense of how your audiences are changing? Are they significantly different than the audiences you had at the Bridge? Are you pulling in a lot of the young tech kids who have recently moved to the City? Grannell: Yes. We sell more tickets when I show a '90s film because there are more young people here now than there have been in so many years. Young people with money! Young people who want to go out on the weekends! The good news is—while the city is changing, and it's awful, I'm very afraid of it and I have a lot of anxiety around it—unlike what I feel I experience from friends living in Manhattan where Wall Street and Rudy Giuliani steamrolled over the East Village and a lot of the counterculture underground scene and where a lot of those bankers and brokers really didn't have much interest in getting to know that culture, I do find that with a lot of the new people moving to San Francisco—yeah, they're some assholes for sure—but, there are also a lot of creative, interesting, fun, engaged nerds who aren't afraid of a drag show. They'll come out and support what we do. And it's been both men and women. It's interesting to see that a movie like Whatever Happened to Baby Jane? is a harder sell for me because it's in black-and-white. It's an older film. There's no nostalgia for it from people ages 20-40. The nostalgia for Baby Jane is from 40+. It's a constant balancing act for me now trying to figure out how to program and do shows that I enjoy and like and that will also put butts in seats. I can't do all-'90s movies all the time—that wouldn't be interesting or inspiring for me—but, balancing that with stuff that might feed my personal interests a little bit more has become a creative challenge. Yes, the new demographic in San Francisco is evident. As producers and artists, we all feel it. Guillén: You raise a fascinating cultural point: the connection between parody and nostalgia. How essential is nostalgia to effective parody? Grannell: Very! They're entwined. I tend to call it a cult. There needs to be a strong cult following for a movie. The audience has to have a certain amount of nostalgia, even as they experience it for the first time. Even if you didn't grow up with Pink Flamingos, people really remember the first time they were exposed to it. That could be a kid who saw it no less than five years ago or someone who's older and saw it in a movie theater. They have a connection to that experience that's a part of their personal history. Then the cult builds and you try to determine, "How big is this cult? Is it a big enough cult that I can do a show at the Castro Theater where I need hundreds and hundreds of people to break even financially?" That's the down side of doing a show at the Castro. Some of the niche films with smaller cults—like, let's say, David Cronenberg's Rabid (1977)—strong cults but smaller in numbers, often are the films that I'm most inspired by, like George Kuchar's Thundercrack! (1975). It's a real guessing game. My partner once said to me, "You're in the gambling business." With all these new shows, I'm basically guessing. There isn't a survey I can do. I have to sense it and feel it out. 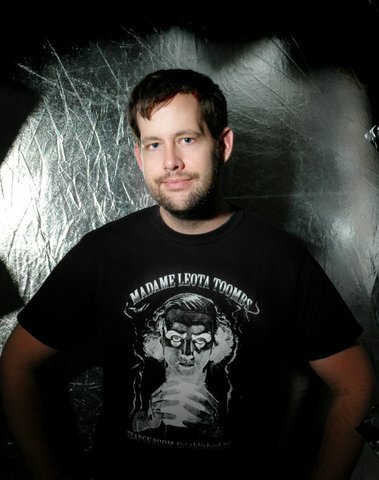 Guillén: Pursuing the process of what goes into mounting a new Peaches Christ production, specifically the upcoming Addams Family Values, how do you cast? How do you strategize? I'm sure most folks think, "Oh, Joshua's up in his midnight attic coming up with his outrageous ideas." Rehearsal selfie, courtesy of Peaches Christ Productions. Grannell: Addams Family Values has been one of those movies that's been on a list. We have an ongoing list that's quite lengthy with possibilities and I would say Addams Family Values was towards the top 20 movies that I would consider doing. But honestly, when Jinkx Monsoon's album came out unbeknownst to me—she made her album while we were prepping for Return to Grey Gardens—she had a track on the album called "What About Debbie?" I listened to it and it's her doing a parody of the Joan Cusack character. Jinkx created this whole gospel song "What About Debbie? What about me?" I listened to that song and thought, "That's it! We're doing Addams Family Values." That song is incredible. 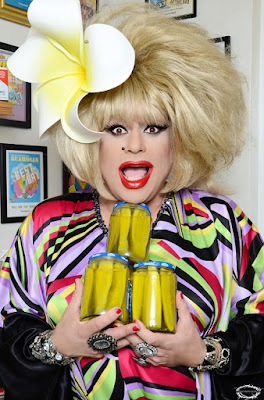 Jinkx Monsoon as Debbie Jellinsky is hilarious. I thought, "We're just going to do it!" 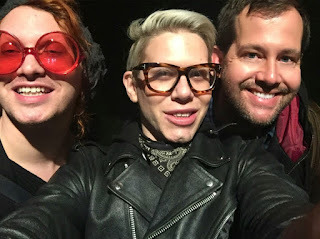 I said to Jinkx, "What do you think? Should we do Addams Family Values?" Jinkx and I are—what's the word?—almost trouble together because we have too many ideas. We brainstorm big and a lot. We've done tons of shows together in a short period of time. We really inspire each other. So it was Jinkx who actually said, "Oh God, how can we do Addams Family Values? Sharon Needles will kill me." Sharon's the Queen of Gothic, Ghoulish, and Dark. I said, "Well, then Sharon should be Morticia, but I'm definitely going to be Wednesday!" And that was it! That was the conversation. Then I brought it back to the team and I was, like, "Hey! Jinkx and I have this idea!" and, of course, the team was like, "Can you afford to have the two of them?" Because we have to look at whether or not Addams Family Values would be a big enough draw since those girls aren't cheap. Then, on top of that, there's 10-15 more people in that show. 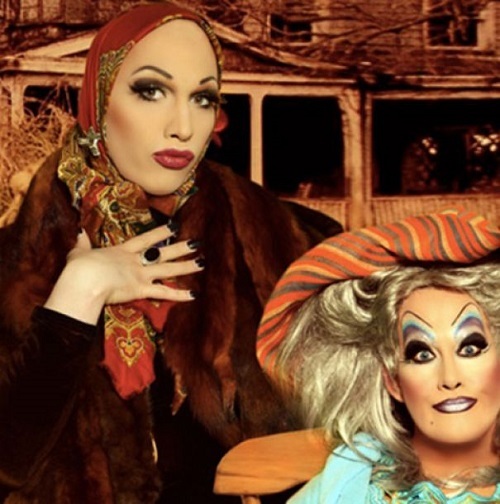 It's not Return to Grey Gardens, which is essentially a two-woman show. The rest of the casting was group-think, except Heklina. We actually toyed around with—I don't want to say who—but, a bunch of different, really funny lesbian comedy people in the scene. Then all of a sudden I had this lightbulb kind of moment when—this is going to sound terrible and she'll kill me if she reads this—Heklina and I were backstage and she was talking to me without her wig on and I saw Uncle Fester! Somehow! It was not something she said yes to right away—she said no, actually—because it's kind of a lot to ask a drag queen who's a known character performer to take off her wig and put on a bald cap and be a ghoul, y'know? Basically, I kept twisting her arm and saying, "You're the funniest queen I know! This is a challenge!" It was more that she just needed to be convinced that it was all for the right reasons. Then I said, "Rewatch the movie because you'll see that it's his story. Uncle Fester is the protagonist in a lot of ways in Addams Family Values." I think that's what sold her on it. She realized it was quite a big part and not a secondary role. Guillén: In developing the pre-show parody, can you speak at all to what that process is like? How do you pull the main beats from the original movie that you think will translate to live performance on stage? Grannell: I basically sit and think about all the moments that the fans most want to see re-enacted because—if you're doing Mommie Dearest, for example—you know that you've got to have the "no more wire hangers" moment in there. You know that you've only got about an hour to hit on probably more moments than can fit into an hour. I pinpoint what I think are crucial and then I look at their story or whatever the narrative is and I apply it to the characters I'm writing for, which are always a hybrid of our drag characters and the characters in the parody. Instead of just doing the film as a straight-up re-enactment—which a lot of drag performers will do and which I quite like; it's interesting no matter what when a person decides to re-do something, even if verbatim—I tend to not do that. I tend to come up with a different twist. Sometimes the plot is generally the same, but sometimes even the plot is different. 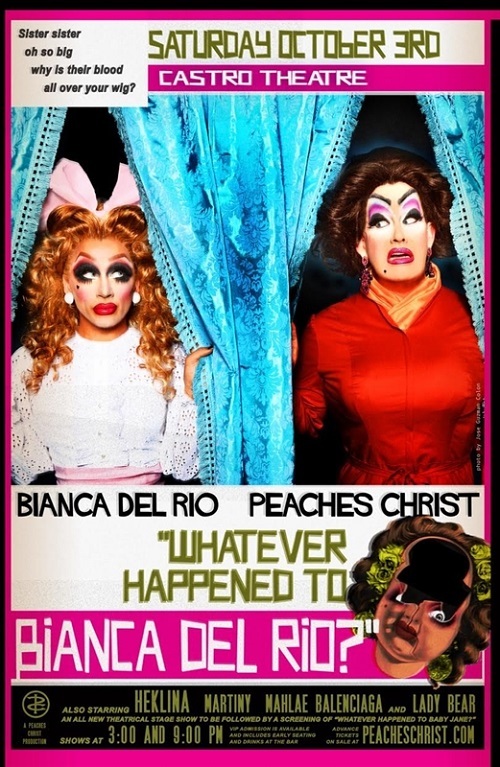 The third act of Whatever Happened to Bianca Del Rio? turned into a slasher, where Baby Bianca murdered all of us. Everyone was dead by the end of that parody. Since I knew we were going to be doing it in October, I wanted it to have a horror finale. That's not what the movie is at all, but I thought the audience would like that. [Laughs.] And they did! And it went well! I go in, decide what the twists are going to be and then usually the first draft is too long and I go back and edit it and figure out what's strong and what's not. Guillén: With cast members living in different locations—you in San Francisco, Jinkx in Seattle, Sharon Needles in Pittsburgh—how do you rehearse? Do you use modern tools like Skype to negotiate ensemble performances? Grannell: Sometimes. The process is really ridiculous. It really should all be more of a failure than it is. When theater people hear about it, they think it's insane. Drag people get it because we're used to, "Okay, let's meet for a run-through and then do it." It's more of a drag number mentality than it is a theater production. They typically get the script about a month ahead of time, or sometimes even less time, they give me any feedback they have—if a joke isn't quite right for their character; I always say, "Please make sure this is all within the realm of your comfort"—so then I'll take those notes, adjust the script, and then we figure out the dance performances with our choreographer Rory. We usually put rehearsals on video, which are sent to the out-of-town leads who are then able to see what the dances look like so they can start to formulate their own choreography, or—if they have specific choreography—we teach it to them via video. That's also how we do road shows a lot of the time. The Provincetown chorus for Return to Grey Gardens got those videos ahead of Jinkx and I arriving so that the chorus who were cast locally were rehearsing with those videos before we ever arrived. They learned from the choreographer on an instructional video. So, yes, we are using technology quite a lot. With the upcoming Addams Family Values, Jinkx and Sharon won't roll in until Tuesday night, we get them to the hotel, and then the whole cast rehearses Wednesday, Thursday, and Friday night for the show on Saturday. Guillén: I'm looking forward to it! Thank you so much for taking time to talk to me today.